Indonesia is the largest archipelago and the fourth most populous country in the world. The nation is composed of more than 17,000 islands and has a population of 220 million. About 42% of the people live in urban areas, and 29%of the total population is under the age of 14. Education is compulsory for children between 6 and 15 years of age, and the literacy rate is said to be 92%. Indonesia was selected to participate in this international study to assess the ability of the public to access information and communication venues, and also to review the role of ICTs across the overall economic, political, and regulatory framework. The researchers assessed how the venues function, how they serve user needs, how they meet operational constraints, how they realize successes, and how they meet the needs of underserved communities and groups. The methodology for this study began with a literature review of more than thirty documents. The review was followed by selecting specific venues, site visits, and surveys of key stakeholders, venue operators, private-sector professionals, and officials of the Department of Communication and Information. The venues were selected because they were: 1) open to public, 2) government backed, 3) required no fees, 4) distributed nationally, and 5) address the information needs of the population, especially those who cannot afford to own a computer, or who lack the skills to use information and communication technologies (ICTs). The researchers conducted interviews in person and by telephone. They examined literature on 1) e-government, 2) the national and local governments, 3) the use of ICTs in Indonesia, and 4) economic and social reports from the Indonesia Central Bank and the Board of Statistics. The researchers obtained data through questionnaires and conducted interviews with sixty public venue operators at nine locations. 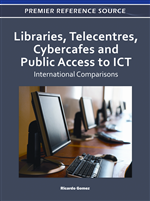 This study focused on the public libraries, Warmasif (information society cafés) and Warintek (technological information cafés). Indonesia has 14,516 public libraries, 63 Warmasif, and 84 Warintek. Computer education and capacity-building programs were established in the 1980s, and there was a significant increase in Internet access in the mid-1990s. Large numbers of people began regularly to use computers at Internet cafés, and the improved economic conditions allowed greater numbers of the people to afford personal computers. There is a perception among many Indonesians that computers are generally expensive and are to be used by higher-income and higher-social-status people. In some cases, potential users are unaware that there are services provided by the government and venues where free access and ICT training are offered. Capacity building and ICT training are urgent needs. In the venues studied, operators often lacked adequate training to aid users. Limited economic means limits huge numbers of people, while people with higher incomes and social status have more opportunities and skills to use ICTs. There is also a lack of locally relevant content. Most people who use public information venues are educated, young, and ICT literate.